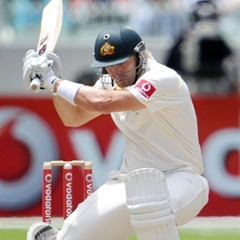 Adelaide - Shane Watson hopes to be fit to bat but will not be able bowl if selected to play in this week's second Test against South Africa, the Australian all-rounder said on Monday. The 31-year-old missed the drawn first Test in Brisbane last week because of a calf strain but was named in a 13-man squad for the Adelaide match, which starts on Thursday, and given a chance to prove his fitness. "At the moment every day is just about trying to get through and hoping that my calf continues to progress really well," he told reporters after training at the Adelaide Oval. "At this point in time, the most important thing is to be able to run consistently without really hurting it, so bowling at this point of time is out. "For me, it's just getting out to run around and do the skills I need to do to be fit to play as a batsman to start with." Australia's team management have given conflicting messages about whether he would be considered only as a batsman for the test against the Proteas. Watson, who averages 37.54 with the bat and has taken 59 wickets in 35 Tests, has been plagued by injuries throughout his career and missed the entire four-Test series against India last year. Lefthanded top order batsman Rob Quiney, who scored nine runs in his one innings on his Test debut at the Gabba, is again on standby to replace Watson in the team. The other question mark over the Australia line-up is which three of four pace bowlers in the squad will start the match. Left-armer Mitchell Starc, who missed out at the Gabba, is pressing Ben Hilfenhaus for his place in the side. South Africa's number one Test ranking is on the line in the three-match series, which concludes in Perth (November 30-December 4) after the Adelaide Test.